A Utah couple acting as their own attorneys have filed a lawsuit against Apple and Starbucks over the retailers' recent "Song of the Day" promotion, which offers Starbucks customers a iTunes gift card for a complimentary, pre-selected song download. In a seven-page formal complaint, James and Marguerite Driessen of Lindon, Utah say they developed in 2000 (and successfully patented in February 2006) a utility dubbed RPOS, or retail point of sale, for Internet merchandising. 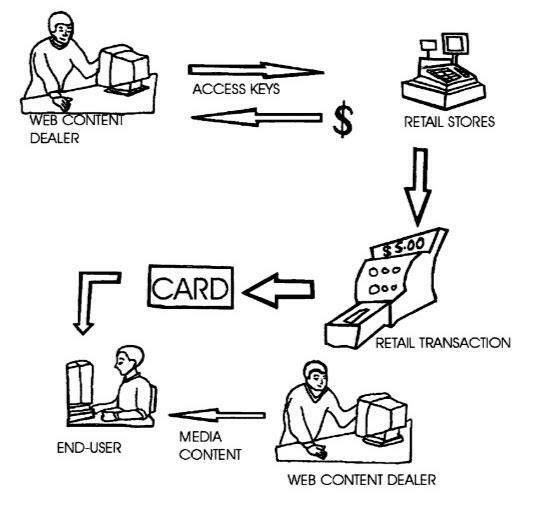 The concept, which forms the heart of the infringement lawsuit, would allow gift cards for pre-defined items that can be sold at a brick-and-mortar store but used online; customers could redeem a card for a dining room set or a DVD, for example. But while the patent was under review, Apple had developed its own similar concept for iTunes Custom Cards. 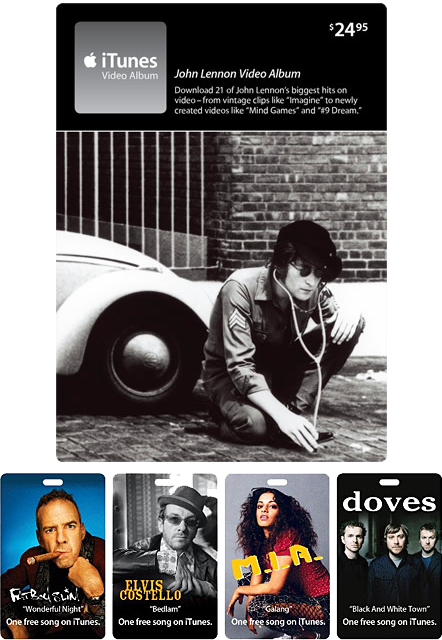 Unlike its past general-purpose gift cards for the iTunes Store, the Cupertino, Calif.-based company's then-new cards allowed shoppers to buy a card for a specific artist's album or song, complete with custom artwork. This apparently direct comparison led to legal pressure from the Driessens, who asked Apple to license the patent once it had been granted —only to learn after discussions that Apple had simply pulled the iTunes cards from stores in the US, leaving the products on UK shelves alone and the Driessens without the possibility of a licensing deal. An illustration of the Driessens' patent on gift cards. To the plaintiffs' surprise, however, Apple appears to have simply resurrected the American version of the concept under a different name more than a year later, in November 2007. Called a Digital Release Album, the card was once again tied to a specific iTunes song or complete record. An iTunes Digital Release, from 2007 (top); iTunes Custom Cards, from 2005 (bottom). In releasing these cards, the Driessens say, Apple is simply hoping to skip royalties by implying that customers can claim songs with a notebook computer, iPhone, or iPod using the iTunes Wi-Fi Music Store at a local Starbucks coffee shop, bypassing the need to return home. Though superficially different, this is just an infringement of the patent under a new name, the lawyers argue. Starbucks is said to be a complicit partner in the infringement as a willing distributor, selling the cards across the US and holding its "Song of the Day" promotion to encourage purchases of the allegedly infringing iTunes cards. Apple has not publicly responded to the charges made in the lawsuit, which would bring the complaint to a jury trial and ask for triple the normal damage compensation as well as issue a permanent injunction barring both Apple and Starbucks from selling the offending cards. However, it's notable that Apple's WI-Fi Store sites aren't believed to have referenced the cards, and in current form only spur customers to buy directly from iTunes itself. Separately this week, Apple was also subject to another suit with seemingly fewer merits, this time manifesting itself in the form of a four-page complaint by John Martin of Rockford, Illinois. The plaintiff in this second lawsuit accuses the iPhone maker of infringing on a patent for controlling an electronic game system with a finger-release touchscreen serving as the control mechanism. In selling one or more similar products —which are unnamed in the document but may include the iPhone and iPod touch —Apple is knowingly drawing on at least some of the patent for its own unlawful gain, Martin's representing law firm says. As with the Driessen suit, this new case would block Apple from selling any of the alleged infringing products and would look for both royalties as well as "enhanced damages" to compensate for the perceived losses.